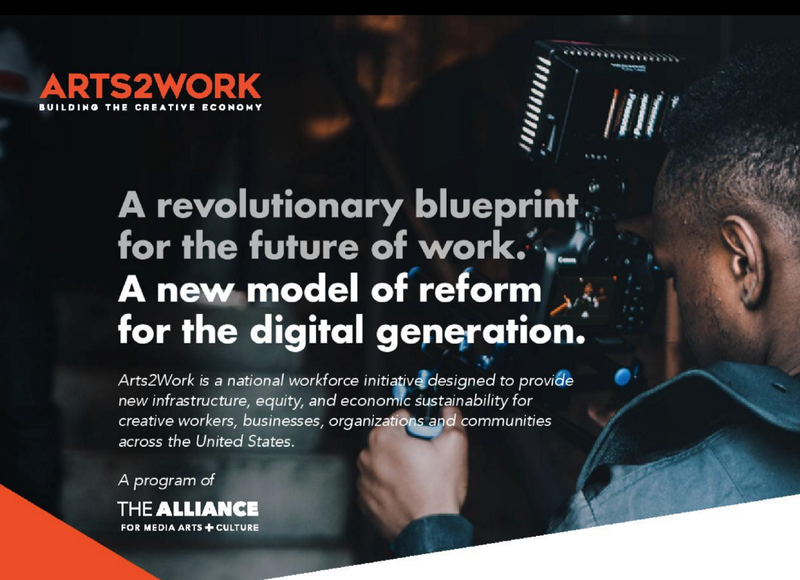 Arts2Work is a new creative workforce development initiative sponsored by The Alliance for Media Arts + Culture that includes the very first federally-registered National Apprenticeship Program in Media Arts and Creative Technologies. It’s a jobs program for storytellers; with a vision of transforming the creative economy, building a world where #oscarssowhite is a thing of the past, and where the power of the #metoo movement has led to a new generation of women leaders in media. We believe that if we want to change the world, we’ve got to change the stories first. 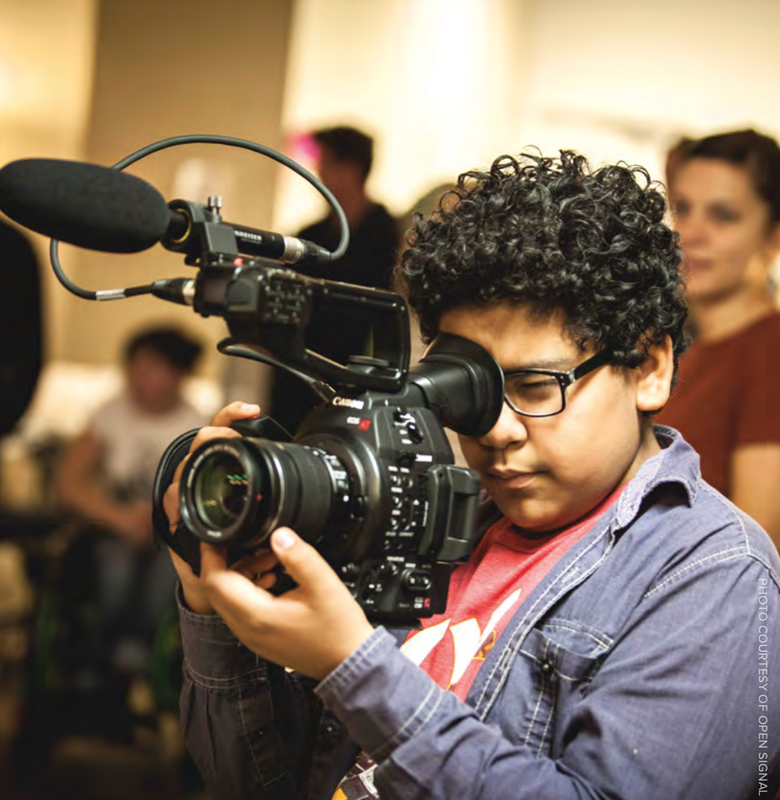 When The Alliance for Media Arts + Culture decided to get into the Apprenticeship business, we created Arts2Work on behalf of creative media artists across the country struggling to find sustainable, reliable, rewarding, living wage jobs. The job market is daunting for filmmakers, media producers, editors and other creatives emerging from high school, college programs and film schools alike, and there is little infrastructure to support accessible pathways for in-demand jobs in the industry. 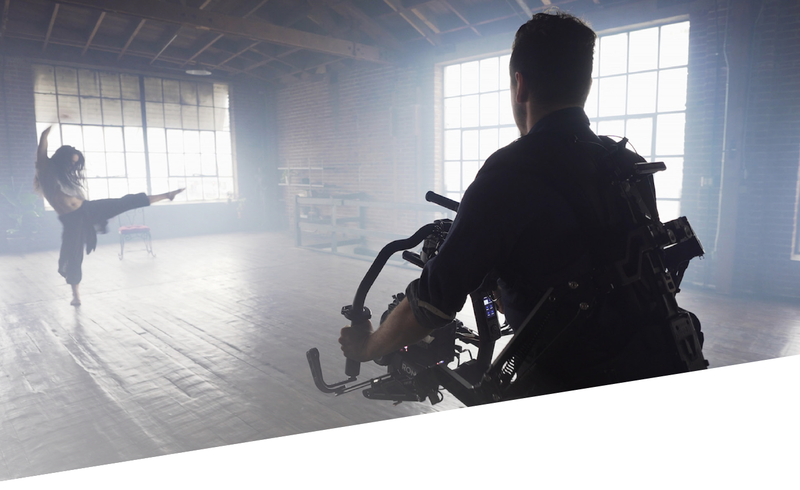 Required skills evolve daily with emerging technologies, you need an impressive reel of powerful stories and visuals just to get your foot in the door — and you can’t build the reel you need without professional experience. Internships are sometimes available for students enrolled in a program — but only the ones who can afford to work for free can take advantage of those opportunities. And all this is exponentially more challenging for producers from racial and ethnic minority groups. Check the research; if you don’t look like the CEO, your chances of getting hired are slim to none. After our first phone call to the US Department of Labor, we knew that we were embarking on a paradigm-shifting journey. There were no federally-registered Apprenticeship programs in our sector, and therefore no possibility for creative workers to participate in the federal workforce development system. This was our opportunity. From that moment, we started acting like a National Program Sponsor on behalf of our thousands of members who deserve the same leg up as plumbers, electricians, pipefitters, and elevator installers, who can get paid to learn on the job, receive hours of classroom and online training, and whose employers can receive subsidies to defray the cost of the apprenticeship. We knew we had to focus on jobs and make the business case for Apprenticeship, showing US media companies how their counterparts have leveraged apprenticeship for a positive return on investment. 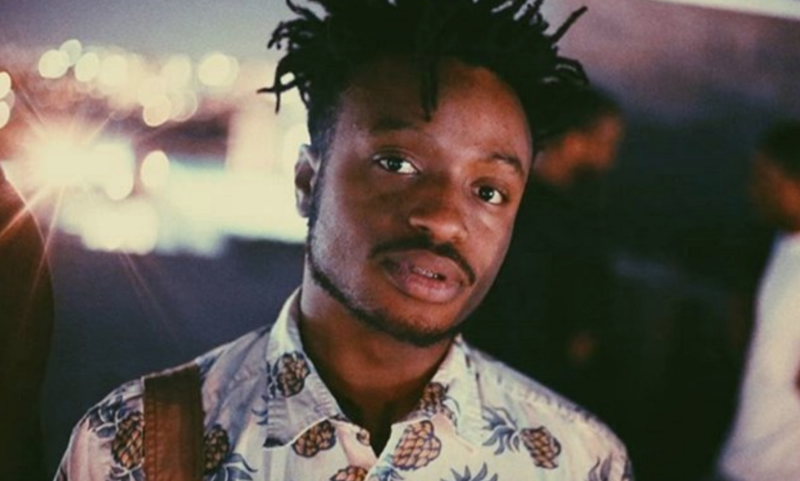 But this is not just about creating a source of skilled, innovative workers in a sector long known for entrenched practices that deny opportunities to “outsiders.” Embedded in the soul of Arts2Work is a set of ideas and practices designed to bend the arc of #oscarssowhite and the #metoo movement towards a more just and equitable ecosystem for all. This work did not come out of the blue for The Alliance; we were designed for it. The organization has been advocating for the field since 1980 when it was founded by an eclectic group of media arts organization leaders who realized they could strengthen their social and cultural impact by working as a united force. From day one, The Alliance worked to raise the profile and influence of the media arts on behalf of a growing and changing membership. Today, we are a network of networks: local, regional and national media nonprofits, international NGOs and strategic business partners from all sectors, as well as individual media practitioners and educators across disciplines. In a time when the demand for digital content is higher than ever, emerging media technologies are evolving at light speed, and diverse audiences are demanding stories by, for and about their own lives — there is a crisis of access to meaningful, sustainable work and a dearth of opportunity for creative startups run by women, people of color, and others outside the venture capital power structures. ARTS2WORK IS A BIG IDEA BASED ON A LITTLE-KNOWN FACT. THE FACT: IN 2015, THE ARTS SECTOR IN THE UNITED STATES CONTRIBUTED $166.3 BILLION IN ECONOMIC ACTIVITY, SUPPORTED 4.6 MILLION JOBS AND GENERATED $27.5 BILLION IN REVENUE TO LOCAL, STATE AND FEDERAL GOVERNMENTS. THE BIG IDEA: IT IS TIME TO RECOGNIZE AND EXPAND THE HUGE CONTRIBUTIONS OF WORKING ARTISTS TO THE U.S. ECONOMY THROUGH A NATIONAL SYSTEM OF INVESTMENT IN CREATIVE PEOPLE, BUSINESSES, AND NONPROFIT ORGANIZATIONS. So how do we transform the broken system? How do we take the existing model of Registered Apprenticeship, customize it to fit the needs of creative employers and workers, and actually create the conditions where more people have the opportunity to advance and thrive in the industry? This is our big idea. We are looking to create pathways out of poverty through access to on-the-job training for living wage creative careers. We are working to replace a culture of disposable interns doing meaningless tasks, with a culture of apprenticeship where workers and employers are accountable to one another in an environment of respect and inclusion. We want more voices from the margins moving to the center, more creative talent being acknowledged and utilized, more independent producers thriving economically and investing in their neighborhoods, more companies able to expand and keep current with new technology. We want it all. According to the report, to dramatically increase the number of apprentices in the United States will require “boosting public awareness, expanding into nontraditional occupations, mitigating the costs to sponsors, enhancing research and certification standards, and improving coordination with education systems.” Arts2Work has become a national Program Sponsor committed to Apprenticeship development and expansion — building a new, culturally-responsive model relevant for creative media careers, journalism and related professions. An Arts2Work Apprenticeship is a one-year, learn-on-the-job program, including one-on-one mentorship, project-based learning, technical certification and 150 hours of professional classroom instruction (in person and/or online). We can customize training plans with each participating employer, offer transferable college credit in many cases, and will soon be adding additional job categories like Digital Archivist, Cinematographer, and Game Designer, in addition to Producer and Editor. Apprentices need a minimum experience level to be ready for Apprenticeship we will work with regional partners to launch pre-Apprenticeship programs that enhance technical skills, offer entry-level professional certification, build collaborative relationships and orient trainees to the reality of work in creative media and emerging technologies. In 2019, we will launch nationally in partnership with some of the first Arts2Work states, the first Arts2Work cities, the first Arts2Work certified training centers, the first Arts2Work employers and mentors, and the first Arts2Work apprentices. With adequate funding in place, we will also launch pre-apprenticeship programs to prepare young creatives, train and support mentors, and provide technical assistance to employers so they can provide the best possible environment where their new apprentices, and their senior staff, can advance and thrive. The Alliance has received generous funding to support Arts2Work development from MacArthur Foundation, Wyncote Foundation and Adobe, and we look forward to building a portfolio of public/private investment moving forward. We are particularly grateful to these foundations for their support of the vision of Arts2Work. Traditional workforce development funders do not work with creative professions as a practice, and arts funders are rarely approached about federal workforce development initiatives. We believe that the potential for a paradigm shift is real. With private, federal and state investments in the Arts2Work registered Apprenticeship model, engagement from a diverse group of visionary employers in the program and the Arts2Work Accelerator Fund — we can go back to Ava DuVernay, and all the hopeful artists, mediamakers and producers of the future — with a new narrative of change.